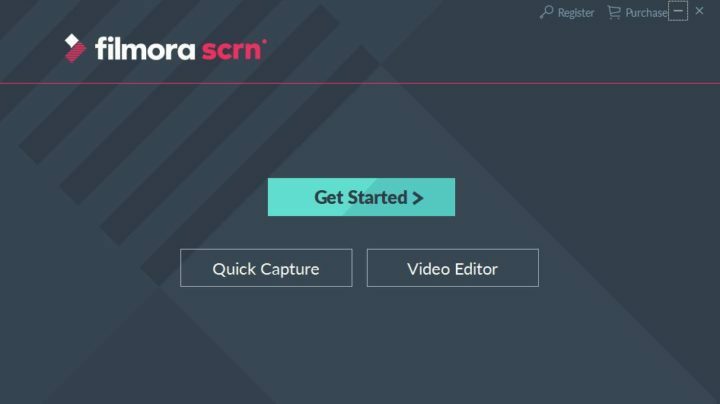 3ptechies » Reviews » Software Review » Wondershare Filmora Scrn Review: a Solid Screen Recorder Software? If you are looking for the best free ways to save online videos, create tutorials, make DIY videos or record a full game-play: Then you should consider “Screen Recorders”. 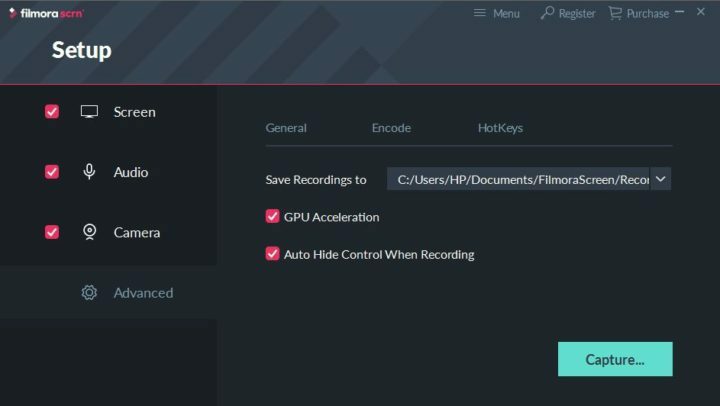 Wondershare Filmora Scrn is a freemium tool that gives you unlimited access to record and edit every single action that happened on your PC screen. We have reviewed a lot of tools from Wondershare Inc. and can attest they’re really good with their crafts. Today, we’ll be reviewing a screen recording software from the company. It is not completely free but even the free version lets you do a lot of video recording and editing of screen activities. The latest version of this software comes with lots of useful functions that will ease your video recording and screen editing tasks. Filmora scrn allows you to do “drag and drop” functions while editing videos with this handy software. Other pronounced features of Wondershare Filmora Scrn is outlined below for your learning. Customizable recording layout: You can choose/select a particular area on your computer screen you wish to record using the nodes at its ends. Custom cursor type: With Wondershare filmora Scrn, you can tweak your cursor till it suits your design preferences. i.e: you can change the size, style, and color of your mouse cursor. Full-kit video editing suite: This free software comes with every useful tool you’d ever need to edit your clips and videos to make them stand-out. FPS (15-120): Actually, this feature is best for gamers. With Filmora scrn installed on your MAC or Windows PC, you can record fast-paced games (Up to 60fps for Macintosh operators). Picture In Picture (PIP): The PIP feature lets you add another image or picture to the original one. An example is adding a faceman while recording/editing game videos. Import everything: Up to 50 plus more different media/file formats are supported by this utility app. Other lovable features of this software includes: Export and convert your clips or created videos to MP4, MOV, GIF, custom recording field, annotations, and etc. Availability and Pricing: Wondershare Filmora Scrn software is freely available for both Windows PC and Ma OS X users. It has free and paid versions. The free version is limited in some ways while the premium version gives you unlimited access to every of the app’s function. The Pro version retails at $19.99 and $29.99 for a one-year license and a lifetime license respectively. Go to the company’s official website and download the version for your PC machines. Connect to the internet and run the .exe (or .dmg) installation file. The full software setup will be automatically downloaded and installed on your PC. Now, you can start using Wondershare Filmora Scrn. Recording and editing videos with this software works out of the box, as there’s no learning curve needed for it. 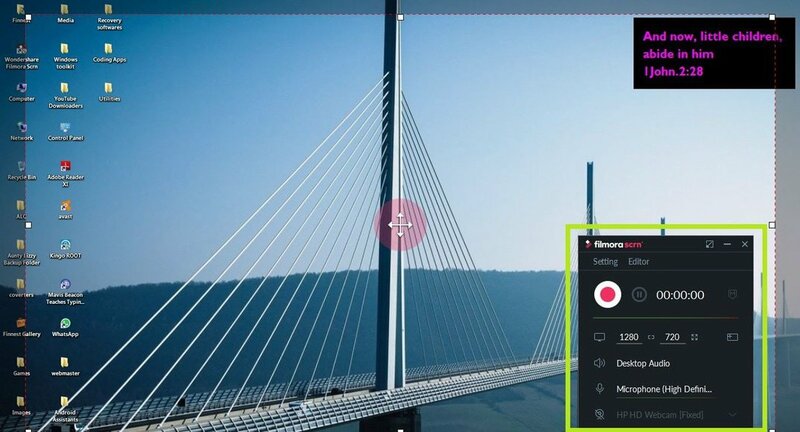 Quick Capture Mode: Launch the program, you’ll be greeted by a simple window with three options – Get started, Quick Capture, and Video editor. The “quick capture” option lets you record activities on your PC screen with the default settings from the software or the previous settings by the last user (if you’ve used the software before now). This option lets you activate extra features of the software. To do custom video recording with Wondershare filmora Scrn: Simply launch the software and click on “Get Started”. This option takes you to the settings window where you’ll be able to customize how you want the recording to be. For example, you can choose if you want to record your full PC screen, or set a custom size. You can also choose to record a target screen. 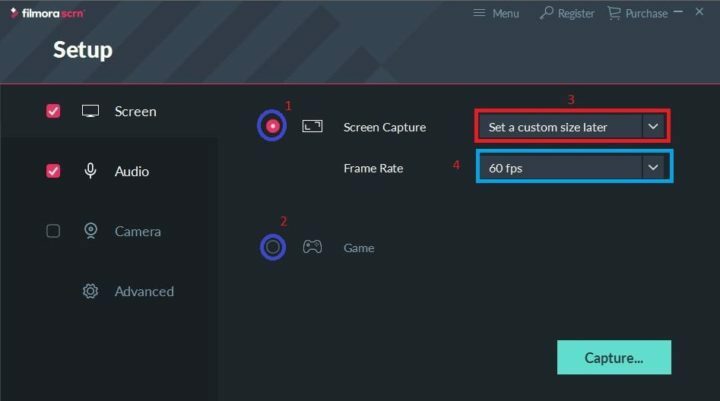 An option to choose your desired frame rate is also available from here and you can as well define what you actually wish to record. ie; Either an activity, music video or game-play on your PC screen. Furthermore, you can configure the audio settings to suit your preferences. i.e; you can set the program to record sounds from the background or not to record any sound at all. The camera option lets you configure snapshot options such as: setting the snapshot frame rate and overall resolution. Do not touch the advanced settings option except you’re sure of what it means. When you are done configuring the recording output of your choice, go ahead and click on the capture button to start recording. Right on the recording overlay, before you start recording your screen, you can still include/exclude some settings using the mini settings box at the bottom-right end. Note: Once you start recording, you cannot edit any of the settings/options. After the screed recording is completed, Wondershare Filmora Scrn launches the video editor immediately, so you can quickly edit your recorded video clips. Wondershare Filmora Scrn comes with some of the most useful video editing features you’d ever need. 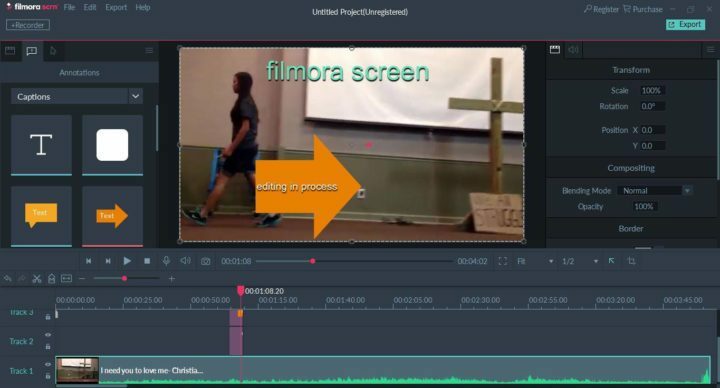 We have earlier explained how to edit videos with Wondershare Filmora, but would like to talk about Filmora Scrn today. Frankly speaking, anyone that’s good with using Filmora video editor can effectively use Filmora Scrn as there’s no much difference with the two. Wondershare Filmora Scrn (in my humble opinion) is a good PC screen recorder with lots of features. The recorded video output is impressive and perfect for creating video tutorials and amazing DIY videos. Editing with Wondershare Filmora Scrn software is easy, and thus makes it a lovely option for all classes of users. The interface is extremely intuitive and very user-friendly. I fell in love with the free version of the app as the only major limitation is the watermark, which shouldn’t be an issue to most home users. All in all: Wondershare Inc. is known for developing good software and Filmora Scrn is not an exception. In fact, it is popular among bloggers and would easily fit into any top 10 list. We’d love to hear your views, opinions, reviews, and reservations on this handy tool. Please do share them through the rating widget above or the comments section below. This is a Money greedy app.